If you’ve got some crazy wild hair like my daughter then you have come to the right place. Hair that is dry or tangles easily likes hers does. Maybe hair that you’re trying to grow out, but have ends get a bit dry, especially if you are using alot of commercial conditioners. Applying liquid oil to hair tends to leave it oily for a few hours until it is absorbed. 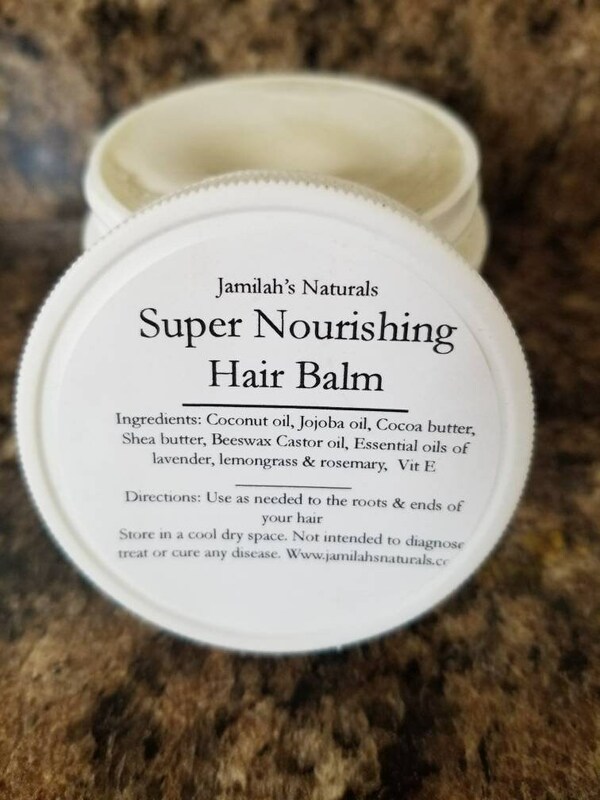 So I have made this really awesome hair balm that nourishes and is absorbed quickly. Use as desired one or more times a day to the roots and ends of your hair. Does not need to be rinsed out and can be used as often as desired. Crème qui sent très bon! Reçu aujourd'hui. If you are trying to grow and protect your natural hair. This product is the solution! I purchased this product shortly after coloring my natural hair. After the first use, I really loved how my hair responded. And, the smell omg the smell. So refreshing and relaxing. So yea, I really enjoy this hair balm. But the most amazing thing about this product is the growth benefit. Like I said, I purchased after coloring, so it’s easier to see the new growth. I’m averaging about an inch a month and my ends and edges are ever so healthy. I purchased 3 items. Delivery was fast. Love the way my hair feels and smells!!!!! This order as well as a second order I placed last week arrived on time and in excellent condition. I do like the hair balm however my daughter apparently likes it more! She uses it for herself and her daughter, and she "borrowed " it, I haven't seen it since!